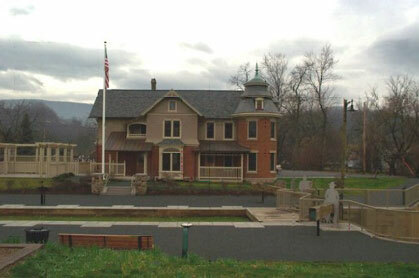 This project created a heritage park and visitor orientation center at the former site of the Hollidaysburg Canal Visitor Center in Hollidaysburg, Pennsylvania. The project site is steeped in historical relevance; it marks the location where goods and services were transferred from the Pennsylvania Main Line Canal to the Allegheny Portage Railroad for transport to western destinations, such as Pittsburgh. The project included the construction of a pedestrian bridge linking the east and west sides of the canal; restoration of an existing canal lock; restoration of the historic Reiser House into a visitor and information center; and construction of a park area at the site. This project was funded with a combination of funds obtained from the Borough of Hollidaysburg and a grant from the Commonwealth of Pennsylvania through the Redevelopment Assistance Capital Program (RACP). Thomas & Williamson assisted the Commonwealth in reviewing the grant application and provided monitoring services for the Commonwealth during the construction phase. Our firm worked with the Borough of Hollidaysburg and the Commonwealth to verify the funding sources, review the project budget and develop a cash flow during the review of the grant application. During the construction phase, we periodically monitored the project for the Commonwealth. Our services included verifying the receipt of funding, monitoring the bidding and contract procedures, reporting on the status of the construction schedule, and ensuring that grant compliance issues were being followed.